National anthems make me cry. Not all national anthems, just mine. 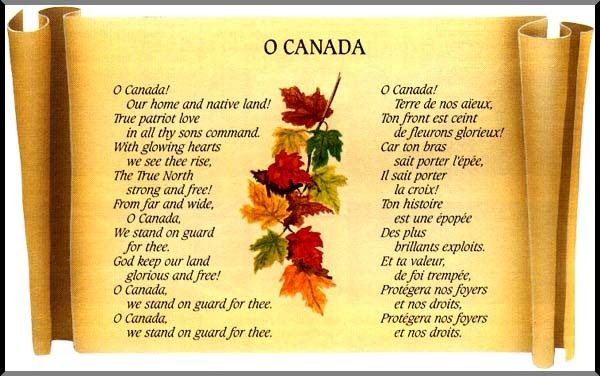 Because I’m a hybrid – that is to say, an Americanadian — I have two national anthems: The Star Spangled Banner and O Canada. My worst nightmare? A joint Canadian and American event, kicked off by not one but both national anthems, usually with a bagpiper thrown in to up the emotional ante. By the time the last verse wraps up, I’m heaving with sobs and in literal black face; even waterproof mascara cannot withstand the upwelling in mine eyes of tears unleashed by these patriotic paens. And I don’t even much like these songs. Not only are they impossible to sing, but they are fundamentally silly. “True patriot hearts in all thy sons command.” Really? What are all of Canada’s daughters doing? Canning? And, “With glowing hearts, we see thee rise!” Rise from where? To do what? As for the back story to The Star Spangled Banner — based on a poem written by a lawyer and amateur poet after witnessing the bombardment of Fort McHenry by the British Royal Navy in the War of 1812. All I can say is, “Keep your day job, Francis Scott Key!” Besides, it wasn’t as if the War of 1812 was a real war. It was more like a war-ette and one the United States lost, even though Americans are loathe to admit it. Yes, the star spangled banner may have yet waved over Fort McHenry, but the British torched the White House and the U.S. failed in its attempt to conquer Canada – a victory Canadians attribute largely to Laura Secord’s cow. That was some cow. The chocolates aren’t bad either. So why do my national anthems make me cry? Patriotism, in and of itself, is scarcely a virtue. After all, what is patriotism but territorialism with an upgrade? Wolves pee to demarcate their territory and then proceed to howl about it. We secure our borders with blood, sweat and tears — like urine, bodily fluids – then break out in renditions of O Canada and The Star Spangled Banner — usually out of key — to celebrate the fact that it’s ours, not theirs. “He’s too territorial,” we say of the dog that bites the postman on the way to the front door. “He’s dangerous. He’s got to be put down.” What about those moron vigilantes patrolling the border between Mexico and the United States, those “patriots”? Are they that much different from overzealous, rampaging dogs? How about putting them down? Canada is a thin warm line hugging a vast frozen frontier – bravado in the form of O Canada fortifies the spirit as we hunker down for yet another long, cold winter – “Yes, we are a people. Yes, we own this, albeit we scarfed it from First Nations. Yes, we belong here even though the land would, by its wintry actions, beg to differ.” It’s like my mother said. “I understand why people went to Canada. What I don’t understand is why they stayed.” Needless to say, Martha Nell was not a big fan of cold. As for the United States, I suppose there are more fractured societies, but it’s scarcely united. Democrats think Republicans are from Mars and Republicans think Democrats are from Hell. Yet, at every sports event, up to our feet we leap to hear our national anthem mutilated – our idea of a great send off to the men and boys who, twenty years later, will have puddings for brains. Hooray for us! Still I weep. I guess I’m a sucker. For that one glorious moment when I am swept up in the heady romance that is nationalism, I feel at one with the past, with history, with those who have come before me and those who will come after me and all of those whose voices are raised alongside mine. Isn’t this grand, I think. Aren’t I blessed? Does God not shed His grace on me? And then the moment ends and I realize that I 1) don’t believe in God; 2) have racoon eyes; and 3) unless this is the Democratic Convention, many of my fellow warblers are probably from the Red Planet. Maybe we should do away with national anthems altogether and commission an Earth anthem instead. I could get behind that. Only, please, can it be a little less lame than the ones we’ve got?